Inky Dream: Super - SirStampalot. I made this card for Sir Stampalot. This is my first time entering for them and if you haven't already, you really should pop over and check them out. The prizes are outstanding and the DT work is stunning! Lots of different interpretations of the PUNCH IT theme. 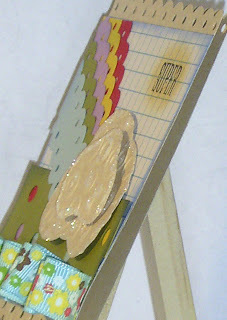 I decided that instead of using a variety of punches, I would use a simple scalloped and hole punch in an unusual way. Also for Stampin' for the Weekend which has a Summer theme. 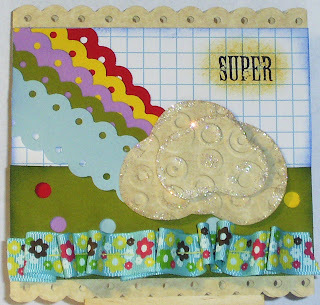 Love punching and embossing...SUPER card. Thanks for sharing at Sir Stampalot this month. Thanks for joining the SFTW challenge and good luck! What a beautiful bright summery card. Thank you for joining in the fun at SFTW. Love the modern funky feel to your card and the lovely bright colours. Wow, this is a brilliant card. I love the rainbow! A wonderful card , thanks for joining us at Sir Stampalot this month and good luck! Beautiful card, Farrah:O) Love the great design. Thank you for joining Stampin' for the Weekend, good luck!